Well, it’s August now, but this was one of the cards from the July Make and Take. Each year from July through December I make sure to have at least one Christmas card for the Make and Takes. This makes it so that my guests either already have their Christmas cards made when Christmas comes, or they have great ideas to use for making their Christmas cards. This one looks so elegant and complicated, but it really was fast and easy. This would be a great one to mass-produce if you have a lot of Christmas cards to send out! I started off by cutting a piece of Cherry Cobbler card stock 5-1/2” x 8-1/2” and scoring it at 4-1/4”. I ran the card front through the Big Shot in the Framed Tulips embossing folder. Next I cut a piece of Very Vanilla card stock 3-1/8” x 4-3/8” and stamped the tree from Christmas Lodge onto the card stock in Garden Green ink. Then I cut a piece of Vellum card stock 2-3/4” x 4”. 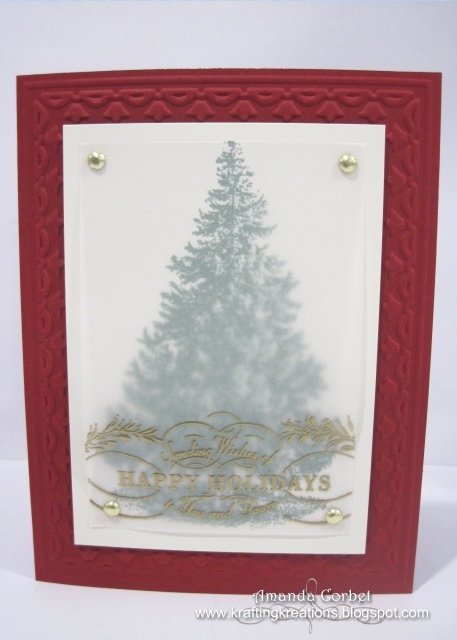 I rubbed the Embossing Buddy over the bottom portion of the vellum then stamped the greeting from Christmas Lodge onto the vellum in Versamark ink. I covered the stamped image with Gold embossing powder, tapped off the excess, and heated it with the Heat Tool. 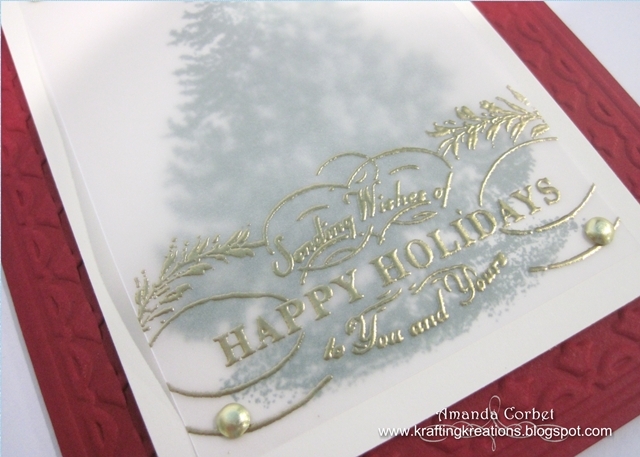 Once the embossing powder had cooled I placed it on top of the Very Vanilla card stock on my Stampin’ Pierce mat and pierced a hole in all four corners of the Vellum. I used a Gold Brad in each hole to hold the Vellum onto the card stock. Then I adhered the panel onto the card front in the center of the embossed frame with Stampin’ Dimensionals. That’s all there is to it! Do you like to make your own Christmas Cards? Do you make a bunch of one style, or make a bunch of different ones?